[Updated with video] John Barritt today [Sept.15] submitted his resignations as Member of Parliament for Devonshire South Central and his position as Leader of the Opposition. 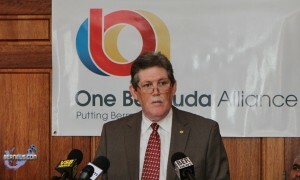 The resignations follow Saturday night’s election of Senator Craig Cannonier as Leader of the One Bermuda Alliance. Mr. Barritt’s resignation opens the way for Mr. Cannonier to contest a by-election for the right to represent the people of Devonshire South Central and win a seat in the House of Assembly, thus becoming eligible for appointment by the Governor as the Official Leader of the Opposition. The Bermuda Constitution requires the Premier of Bermuda to set the date for a by-election. Mr. Barritt’s resignation today leaves plenty of time for the by-election to be held before Parliament returns to business on Friday, November 4th. Mr. Cannonier said he was deeply grateful for the opportunity Mr. Barritt had created. “What John has done is extraordinary. I will do my best to justify his exemplary and gracious act. He is a great Bermudian, a man of principle and integrity who is stepping aside to give the country a new opportunity for change. Mr. Barritt embodies the “Bermuda first” commitment that underlines the OBA, and I see his actions today as the measure of the man. “An opportunity has been created, but I take nothing for granted. I still must earn the trust and support of the people of Devonshire South Central. That is my mission and I will give it my best effort. There are big shoes to fill. Mr. Cannonier said today’s news does not mark the end of Mr. Barritt’s service to Bermuda. To keep Devonshire South Central residents connected in the weeks ahead, the OBA has set up two contact numbers. People can email constituency12@oba.bm or, as of Monday, September 19, telephone 294-3212. What a guy. Puts Bermuda first. His history speaks for itself. Thank you John. Thank you. If only we had more great guys like John Barritt. JB is a great Bermudian. But he’s not going anywhere. He will stay with the OMA and help to reform govt, provided of course the Bermuda voters give the OBA the mandate, which I think they will. Now list all the wonderful accomplishments of John Barritt, he speaks out both sides of his mouth, he supports deceptiveness, he supports running for a political party and when needed to fool the electorates he switches and joins another party. He promises his seat to others, like it is his to give, taken #12 for granted, he supports kicking out black leaders who are not yes men, he is not a devil but he show is the devil’s assistant. What goes around come around. He kicked out Swan and didn’t flinch, now the BDA guys made him keep his promise of giving up that safe ubp seat. Read today’s RG – he did it very reluctantly and if they find another safe seat, is why he took so long from Saturday to Thursday to resign is business the old way. Unsupporter of the Old Boys Association! Hopefully our over the hill PLP MPs will look at this as a shining example of how to exit gracefully – show the public that you place the country above maintaining an income of $168,000 or $68,000+ a year. All, your time has come and is now past. How old are you? Six? Apparently “Voter” doesn’t believe that anyone over the age of 40 aside from the Premier should be in parliament by the looks of this list. Also Lovitta has only been in for 1 term. So how can you call her an over the hill MP. How juvenile. Come back and talk to us when you have a legimate reason why an MP should resign. Actually I am 20 – dont know (or care) about who the 40 Thieves are dont care, racism 20 years ago, but know I am not impressed with what I currently see in the media and personal experience from meeting some of the people listed. @ voter – and who will fill all those shoes ya dummy? While I am old enough to be Voter’s granny, ppl please look beyong his words and see how disappointed he feels about those who governs his life and have plundered it into the future. READ WHAT HE IS SAYING, 40Thieves, Racism, 20 years ago, WE ARE STILL THERE IN THE PAST!! Do you wonder about him, a job for all his peers, their future At least he has the guts to say what 90% of the youth are feeling today…………aint you all listening to his concern? Calling him six is juvenile on our part, not his. He was born 20 years ago into Bermuda’s GREEDY AND SELF SERVING ‘all about me society’ HE IS a product of our social enviornment and we all should take responsibility of his feelings. Ask yourself, do the Voter have a future when all those OLD TIRED MP sit on the hill? You never hear a word from a lot of them. Their safe seats guarantees them a salary of 4 years or more of doing NOTHING, while we all struggle..
yup send those LAZY TIRED ONES packing! Mr. M.P. you get your RETRIEMENT Package when you LEAVE, NOT WHEN YOU ARE EMPLOYED BY THE PUBLIC as their representative not to grease your pockets, year over year! I guess I am 6 years old too!! There are actually some politicians on that list who are committed to Bermuda and should NOT be on that list. By the way, who will replace all those politicians? Bermuda DOES need some type of government. Are you planning on running for all those seats at once? Hey the first four people, Grant,Louise,patricia,Trevor are members of the new UBP/OBA. You actually raise some interesting points. The OBA and Cannonier are basically campaigning on the politics of change. Despite this, their first action after his election is to create a smooth pathway for his ultimate election to the House of Assembly with little expected resistence from the electorate. If we use an analogy from the insect world, we note that sometimes we are strengthened during the struggle (such as the buttefly strengthening its wings). Thus Cannonier may be missing the opportunity for a political strengthening by not contesting a more difficult area. Musical chairs?- I understand Minister Minors is thought to be contesting a St.George safe seat. But that is just a rumour, right? I want a ringside seat for the Furbert bout! A party stalwart v a former leader of the arch rivals–the UBP. ( I’m told the combatants may change though–damn. Name one “safe” seat in St. George’s. So they can have a by-election because Barritt is resigning but they couldn’t hold a by-election to legitimately elect MPs when the former UBP MPs resigned from the UBP? There is no constitutional choice. Barritt’s resignation creates a vacancy and it must be filled. Just imagine what would happen if the voters in #12 were courageous enough not to vote for Cannonier!! They resigned from their party, not their seat, but still, I agree the right thing would be to resign the seat and have a by election especially since Bermudians tend to vote foe the party, rather than the individual. The OBA has shown disrespect to the constituents of Devonshire South Central by removing a dedicated servant in John Barritt, and by assuming that Craig Cannonier will just be able to walk right into his shoes. I am sure the PLP will field a candidate and possibly the UBP or an Independent. While statistically this has always been UBP territory, with the boundary changes and also with the dynamic of the current political landscape who knows what can happen. I predict an OBA victory by a vastly reduced margin than Mr. Barritt’s victory in the 07 election. While I can see where your coming from what you and others must understand is that OBA did not make the choice of removing John Barritt. Mr Barritt decided to step down as was his stated intent last May and while he will be missed i hope this means others will try to fill the void. The OBA didn’t remove anyone, Barritt resigned. Technically he resigned…but I am sure many people…probably the 330 that voted for Bob Richards, really would prefer John barritt as an MP than Craig Cannonier. At this stage, I am not convinced that Mr. Cannonier can fill Mr. Barritt’s shoes. Mr. Cannonier gives good speeches, but I have yet to be impressed by him on the news. agreed, cannonier seems like a good story teller – they can read anything good, but have them speak on their own? Dum Dum is what you will get. Isn’t Barry DeCouto his brother in law? This post should win some type of award!! These blogs are a riot – I listened to Canonier on the radio is he trying to be a down south preacher? he sounds like hes trying to lead the people out of Israel…………..Canonnier, ler my people go. we getting your award ready – shortest term as Senator as your spot is going to Patrice……..Godma Paula’s acegirl. It will be very interesting to see who the PLP proposes as a candidate for the area. In many posts, voters are asking for quality candidates to allow voters sound choices as opposed to simply voting along party lines. Whilst we accept that the area has consistently voted UBP, unless the UBP offer a candidate the constituents should be open to voting for either Mr. Cannonier or the PLP candidate. Congratulations to Mr. Barritt for a long a distinguished career as a Parliamentarian. Thanks very much for your service to Bermuda…stop by for a cocktail! I hope the voters in Devonshire do not reward the OBA. John should of stepped down when the OBA undemocratically formed. I am really hoping that we do not see the OBA rewarded for their complete contempt for Bermudian voters and Democracy. Are you serious?! Mr Barritt RESIGNED his seat, most members of the OBA wanted him to stay. Once the OBA takes over as OUR new Government, if they’re smart, they’ll find a position for this great Bermudian statesman in the Senate. Thank you Mr Barritt for your unselfish service to our Country. So what does this mean for Mr. Cannonier? Does that mean that most didn’t want him to win the Leadership? exactly, some non oba supporters infiltrated (just to make sure Richards didn’t win, lol) and one can expect such with that type of voting, show up, pay $5.00 and vote? Where on earth but in a banana republic have you heard of such? No vetting, at least the same people that attended the UBP Joy Lusher affair and attended the 1st OBA conference are laughing all the way to the bank because they got off a lot cheaper. They paid over $200 a plate for joy lusher’s affair. Just curious! What party vets its members? Well, never heard of any political party that sign them up on the night and they get to vote? Did we also hear today that some signed up online over seas and voted. What a bogus voting system! OBA is turning Bermuda into a Banana Republic should be the next media headlines. or better yet – Give us $5 and you can have the candidate of your choice. Joy Lusher fundraising attendees should demand a refund! but the won’t because is all in getting the PLP out of power and the OBA members into those GP cars. @ LMAO – LMARO…PLP de only ones drivin de GP cars bra! If he really wanted to go, why did it take him 4 days to turn in his resignation? He has been trying to broker a deal to get another safe seat. This is intriguing. To me, it is offensive to the voters of Constituency 12. It assumes they are no more than sheep, and will automatically place Craig Cannonier in that seat because their hero is vacating it. Also, if I were Mr. Cannonier, I would be concerned about the appearance of being “handled”. This whole debacle says, to me, that they (OBA strategists) are not confident in his ability to gain a seat, so they are trying to give him one! I am beginning to get the sick feeling that Mr. Cannonier has become a mere puppet, with strings being played by others. I hope he does something to dispel that impression. I still do not understand how the OBA selected a non-elected politician as leader. This is something the PLP just would not do. The OBA have assumed that voters will select him because he talks well (he reads well, but tends to ramble ad libbing) and says the words “change” and ” for the good of the country” ad naseum. I predict a nasty surprise. Yawn….getting realy deperate, with this utter brainwashing nonsense. You have a Cog that sticks her head in the sand and pretends it was nothing to do with her, some extremists and deadwood. The results speak for themselves. EXACTLY – HOW CAN CANNONIER? how can he not even try to show what he has steam and try to win a seat in the East where he hails from? Premier Cox is an intelligent and smart lady, she can stand on her on. She is not a cog. Premier Cox and Cannonier in a debate, he will not be able to stand up to her. His range of knowledge of governmental procedures and policies are limited. But, oh he does not have to have any knowledge, as Dunkley will be the spokesman, Cannonier merely a “Figure-head”. I vote in Constituency 12, I have nothing but respect for John Barritt and his action. I admit I like Craig Cannonier BUT do not assume that he will get an easy ride to the House. He needs to knock on my door, sit in my living room and answer my questons. I beseech you all – - engage the political process and make your voice heard. If you wish for the OBA to secure the seat now made vacant by John Barritt, vote in the by-election. If you wish to have a PLP, UBP or independent candidate to take the seat, vote in the by-election. Do not just do the “Bermudian” thing – which is to sit, complain, and do nothing on the day, and when it is all over, complain louder on talk shows and blogs. A general election is coming sooner than you think – - we all need to be ready. This is not an endorsement for either party, group or affiliation – - but to truly engage in change for our country – - we, the people, are the “true” government – - let us never forget that. I beseech all to vote for the right person for the right reasons, that will not happen in that seat. they will all vote enbloc for the OBAUPB candidate. I do hope an independent runs and PLP please one of its best there and show them they can’t just take that seat for granted as Barritt did by saying he would give his seat to cannonier like he’s going to will his father’s house to his grandchildren???? Wise Elder when did Barritt say that? As a former elected representative, he is very aware that he cannot give his seat to anyone, it has to be given by the registered voters in the constituency. Check the media – heard him say it on more than one occasion. I agree, we all know that and at the time thought how cocky of him. Well said. I’m getting tired of reading Bernews for all the idiotic comments made by people who refuse to get involved in Bermuda further than complaining about anybody who doesn’t share their opinion. How did Bermuda become such an intolerant society intent on only looking through the rear-view mirror when trying to move forward? Sad. Remember that there will be a bye election as a result of Barritt’s resignation. Therefore only the voters in C12 can vote. The rest of Bermuda can only make their voices heard in that election if they talk to voters in that constituency or generally speak in support of one candidate or the other. It will truly be interesting if all 3 parties and an independant stand in the bye election. To some degree, this bye election may provide a good ‘relief valve’ for all of the recent political rhetoric. All down hill from here . Slip sliding away . With all respect Mr Barritt your a great guy but , you shouldn’t have done it .Some promises you just shouldn’t keep . Remember Paper Chase , .. We do it the OLD FASHION WAY , WE EARN IT . HI JOHN SORRY TO SEE YOU GO YOU WERE THE BEST M.P. IN BERMUDA GOD BLESS YOU AND ENJOY YOUR NEW LIFE AND YOUR FAMILY!!!!!! Could you see a PLP MP doing this? I can’t think of one, really I can’t. This is a fantastic, selfless act, and indicative of the undertones of change. Sorry PLP, but you screwed it up, and even your supporters have given up on you. The rest of us just shake our heads at the madness of why it has taken this long. Several PLP elders are standing down – like it or not Ewart stood down and a young Marc Bean was elected into his seat? But of course anything the PLP does is dark as you claim all their voters, hiding behind the masks. Mr. Barritt did not give up his seat due to retirement or an ambition to move on from politics. He did it as a political strategy for the UBP/OBA. It was apparent that they did not have faith that whoever won the leadership of the UBP/OBA may not be successful in any other safe-seat constituency. I do not think what he done was honorable, as if it was it would not have been done as a result of a political strategy. Craig has been placed in position of power; he did not work for it. It will be interesting how this will play out in the future. But at present he appears to be a mere “Figure-head” working towards gaining votes from the “Black Squeezed Middle Swing Voter”. Craig may be so hungry for power at present and not see the forest from the trees. Win by any means necessary, even if it requires using a Black face to do it. Yes very arrogant and God help us if the OBA wins the next election. We will be place 30 years back and they will keep reminding us how better they are at running us that we are. Ask close allies about the way Dunkley and Barritt speak when not noticed they have a public ear shot. sorry, but 30 years ago, i went to an integrated high school, where i didn’t look at the colour of anybody’s skin with concern. 30 years ago (1981) i lived in a Bermuda where there were jobs, there was opportunity. Tourism was still strong, International business was growning, college weeks were the crazy norm. Hey, if the OBA take us back 30 years, that would be GREAT!! But sadly, that is just rhetoric, as we all know, there is no such thing as rewind in life – we can only move forward like it or not. Stop looking backwards Bermuda – it’s tomorrow you’ve got to live for!!! There is a big difference in the PLP elders standing down, that is just the passage of time. And Ewart Brown – you are comparing him to JB? That’s ridiculous. EB went because his own party was hideously embarrassed with him. By the way, you are the first person to offer any support for EB in months, I’m not sure what that tells us. dum dum, I am not supporting anyone, Ewart nor Cannonier nor John Barritt… just stating that PLP do have MP that step down? and why can’t we compare the 2 men? and why isn’t a passage of time for john barritt who is almost 70? can’t have it you way all the time, for that you need to go to burger king. Why is it so hard for you to just accept that he resigned, thank him for his services and move on? Vote for the PLP, vote for the OBA, vote for an independent. It’s completely up to you, but recognise that the man gave a lot of himself for Bermuda (as do most politicians, like them or not), say thank you and move on. A few of the people that post here just seem to be so jaded and angry at life in Bermuda that they seem to forget the most basic human civilities. It is amazing that the former BDA members left the UBP because they wanted to rid themselves from the “burden of the UBP’s legacy”(racial history), yet they, including Mr Cannonier (remember-turn out the lights UBP), now seek the benefits and priviledges of the UBP in the form of “safe seats”! Mr Cannonaier and Mr Fahy are opportunist! Do you want a viable opposition or do you not? If you want a government to do whatever it wants, whenever it wants, then the answer would be no, you don’t want to see any form of a viable opposition. If however, you are right minded enough to recognise we are ALL better off with a few checks and balances in place, some voices on the other side of the floor to question the actions of our leaders, then you wouldn’t really care how Mr. Cannonaier went about getting to be the leader of the opposition. The fact is that he is indeed the leader of the OBA like it or not. Move on. Move forward. PLEASE!!!! We had a viable opposition but Dunkley, Fahy and Barritt spearheaded to gain personal power and disbanded to fool y’all because they definitely did not fool me. Hudson, move on is easy for those who have moved out. 30 years ago and today with mortgages being threatening still, we have to hold on and not blame the recession on the PLP, how are jobs out where you are? ???? I live here! I will have the pleasure of voting on november 1st and look forward to meeting the candidates. If history repeats itself, the PLP candidate won’t come to my door nor will he or she bother to call. Just to be clear, Barritt did not spearhead anything for personal power – if he did, explain to me now what power he has created for himself exactly. You have blinkers on my friend. BTW, i still have 17 years owing on my mortgage. The Company i work for has laid off 6 people this year and have not hired one and yes, i am truly worried about whether I will have a job in teh next six months. For the record, I do not blame the global recession on the PLP – I blame local policies (term limits, racial rhetoric and divisivness spearheaded by our own government, a balooning deficit, forcing mixed nationality couples (Bermudian married to a non-bermudian) to gain licences to own houses, increased crime and gang activity, a failing public education system, etc etc) for excacerbating the issue in Bermuda. Our own stupidity got us into this mess. Do you think that Switzerland is suffering as much as we are? Do you think that Canada is suffering as much as we are? Do you think that even the Cayman Islands are suffering as much as we are? NO!!! Because their governments and their voters can see further than the end of their noses! Are you serious? “then you wouldn’t really care how Mr. Cannonaier went about getting to be the leader of the opposition.” I Do Care – SORRY!!! How the OBA became the opposition concerns me and how Craig is being ushered in to his seat by John concerns me. Even is PLP was flawless, the voters in Devonshire South still would not vote a PLP member in – FACT. John leading Craig around, with the whole ” na he’s cool, he’s with me” style concerns me the most. Craig seems as if he doesn’t care that he is a mere puppet in this play, that too concerns me too. People are really suffering on this island, so that means me are closely watching everything and everyone. OBA has shot themselves in the foot with this one. PLP hurt themselves with four different leaders since 1998. Sad that we have no real solid choices. Sir, you are entitled to your opinion and I respect that. You should also allow me mine. Unlike you, I have not discounted the OBA as they are in a fledgling state trying to make themselves a viable opposition. Politics is ugly no matter which side of the fence you sit on, but you say “we have no real solid choices” and that i believe to be defeatist. YOu are either part of the problem or part of the solution – what’s it going to be? I’ll move on, and your right at the rate they’re going they will defenitely be the next oposition. However, before I move on let me say this, the formation of the OBA was the most non tranparent political action I have ever seen. One year ago half of their memebers were chanting change and denouncing the old ways of the party from wence they came. Just months later they decided that the party from whence they came wasn’t so bad after all and they along with their former collegues met up and decided to form the OBA. Now, my question is what was the purpose of Fahy, Pattingill, Hunt, Crockwell etc. Forming the BDA if, just a few months later, they were going to join back up with the same people they said were so terrible? Where is the evidence of their transparancy, accountability, and good governance, principles that they cite all the time but yet dont abide by. I know they want to win but, I wish they were a little more honest throughout the process. Craig Cannonier wins the award for politician with the most UMs! He said Um Um no less that 25 times! What a joke, i can see it now, him in DC representing us. OBA, must think we are stupid. A shame. You obviously have never listened to the fake english accent of Paula Cox, the um ahs of Derek Burgess, the speach impediments due to a lack of education by a host of PLP MPs. Watch out for that broken glass as you hurl stones out of that house you live in. My father always said ” YOU CAN”T GO WRONG DOING RIGHT” I have long respected Mr. Barritt, Mr. Moniz and Mr. Kim Swan all from the UBP. Men of integrity. I am sorry to all these men gone and the UBP seems to have vanished. The UBP, with some 40% plus of the voters are deafly silent about all what is taking place. The OBA is not the Official Opposition because they have no Official Opposition Leader. Listen people NO SEAT should be considered a safe seat! What if the OBA loss Mr. Barritt’s seat, then what OBA? Plan B is ………….what ?? Mr. Barritt is gone ! This whole new party started off wrong, with a few who leaving the UBP to the start the BDA, then returning to the UBP, then more confusion , to dissolve the UBP becasue it was not a viable party, then a Court injunction to stop the demise of the UBP, and another exit with of the majority of the UBP fleeing to the OBA. Now we have an OBA leader without a Parliamentary seat, and Mr. Barritt, a seasoned parliamentarian, giving up his seat with the hope of Mr. Cannonier winning the seat. My father was right ” You Can’t Go Wrong, Doing Right” Any comment from the silent 44% UBP Voters????????? I was not going to write in this forum and send a letter to RG again, but every time I send a letter of recent to RG and Bermuda Sun against what the OBA is doing, it never reaches print. I and a few of the UBP others will support not support any OBA candidates in the next election. We voted and made strides but because of a few selfish men, yes selfish and such as Barritt and Dunkley we are now faced in the position of seeing all the hard work to make the UBP into what it is today, a party with a concience, not of the past with the likes of Sir David Gibbons and Sir John Swan but a party supporting acknowledging what happened in the past and to make things right for ALL Bermudians. Not only Whites, but Blacks and every Bermudian living! The OBA has taken all that hard work away and we can’t and won’t condone what they have done with our votes and now think they can take us for granted that we will vote blindly for OBA. Not So. When you do do the right thing the right thing follows. John Barritt orchestrated to oust Swan and now he is trying hard to make others believe he’s doing the right thing by giving up his seat. He is not. He has always been one,if you attended caucus you will know what I mean, he nevers wants to make a decision and when he does he changes his mind before morning. He is getting exactly what he dished out. Don’t feel sorry for him one bit. Now he is dancing to his own music. WOW!!!!!!! I guess I am right by saying “You cant’t go wrong, by doing right” Thanks UBP Supporter for the insight. On another note, Mr. Kim Swan should find a UBP candidates to run in some of these strong or safe seats currently held by the former UBP MP. These MP’s were voted in by their constituents and not any OBA voters! I am guessing there are some UBP voters who still want the representation in the House. Is Mr. Cannonier so weak of a candidate that to get him in the House they have to go without Mr Barritt, and put him in a safe seat. Everyone knows his roots are in the East. Is the OBA unsure that he could defeat a Dame Jennifer, or Lovitta foggo, and instead want to place him in a so called safe seat. last week Mr. cannonier spoke and said ‘there are no safe seats’. Is he trying to convince himself that he will actually have to work for this victory. Mr. Cannonier is a nice enough guy, but this easy path to the top will not gain him much favor on the national scale. Internally within the OBA, I am sure there are those that are not happy that Mr Barritt is being sacrificed for Mr. Cannonier to waltz right to the top. The fact that Mr Cannonier only slightly defeated Mr. Richards is evidence to me that the Party is split directly down the middle. Mr. Cannonier already said it was time for the UBP to turn out the lights…I wonder if he still feels that way, and if that means that he wants Dr. Gibbons, Mrs Jackson, Mrs. Gordon-Pamplin, Mr. Moniz, Mr. Simons to not be candidates. If that happens, the staunch old guard of the UBP may not be so enthusiastic about the OBA. It should all be interesting going forward. I am anxious to see who the PLP put up to fight this seat. They should know that victory is unlikely, but a good effort by a good candidate could garner them a larger share of the constituency. And then the big elephant in the room would be if the UBP runs a candidate or if an Independent runs. Could the non-PLP vote be split among those entities. Time will tell but it is interesting times indeed. Couldn’t agree more. John deceived the voters of #12. He better not come back to my door! Can’t fool us again. I’m voting for the independent candidate! Who from that constituency would step forward to be our independent representative? Can we suggest some names? Wait a minute!!! This is a chance for the UBP to be reinvented with fresh, modern blood/ideas/people/website/voters! Ideally we would not have party politics. We would have some form of proportional representation. But we are stuck with party politics so we have to make do with what we have, the good & the bad. Yup, Devonshire south is being handed to Craig Cannonier. Could you see Paula Cox running in a marginal or a safe seat? Never happen. So why all the fuss from the hypocrits? You did not demand a bye election for Wayne Furburt did you? Get over it. An election is coming. Here is your chance to do something & vote. Vote for the party that has the people with proven management skills, not your ace boy or relative or, worse, just cause they look like you.